Liberty’s Jacob Sincek, center, fights for extra yardage between Olentangy’s Braydon Chitty, left, and Conor Sherry during the first half of Friday’s league battle in Lewis Center. Johnny Wiseman did a little bit of everything to help the Olentangy Liberty football team come back from a 14-point deficit. He led the team in rushing with 91 yards on 11 carries, receiving with 95 yards on four catches and helped out the defense with an interception as the Patriots knocked off rival Olentangy 28-17 Friday night in Lewis Center. It’s the third straight win over rival Olentangy and keeps the Patriots even with its other rival Olentangy Orange atop the OCC-Buckeye standings. Quarterback Mitchell Okuley threw for 216 yards and three touchdowns, including two in the second quarter as Liberty (6-2, 3-0) scored 21 straight points to take the lead for good. For the second week in a row, Olentangy had its rival down by multiple scores and, for the second week in a row, its rival came back and took the lead. Orange overcame a 21-3 deficit to win 30-28 last week. Liberty scored three touchdowns in the final 10:45 of the first half to overcome a 14-point deficit. Conor Sherry intercepted Okuley and returned it 34 yards late in the first quarter to set up Olentangy’s second touchdown. 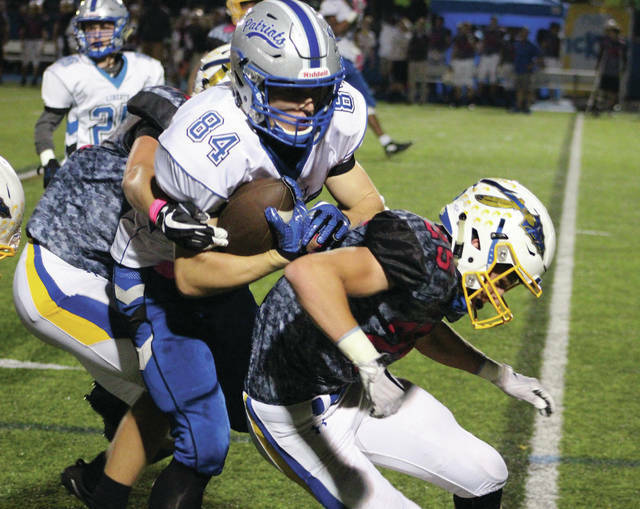 Riley Bruening found Caden Kaiser for a 27-yard touchdown – the second time the duo hooked up for a score in the game. But, Okuley came to life from there. He connected with Wiseman on a 39-yard touchdown with 10:45 left. Then, Wiseman set up a Matthew Webb 1-yard touchdown with a 37-yard run midway through the period to tie the game. Okuley found Webb on a 19-yard touchdown with 0:25 left in the half to give Liberty the lead. Okuley connected with Mitchell Kershner for a 62-yard pass with 6:02 left in the third quarter to cap the scoring. Olentangy (5-3, 1-2) got right to business on its first drive, going 79 yards on eight plays. Bruening found Kaiser over the middle for 21 yards to cap it with a touchdown with 8:16 left in the opening frame. Bruening threw for 230 yards and led Olentangy in rushing with 93 yards on 22 carries. Kaiser finished with 114 yards on six catches to lead the team. Josh Petrone’s 23-yard field goal capped a 12-play, 71-yard drive to start the second half. Both teams continue league play next Friday. Liberty visits rival Orange and Olentangy travels to Westerville North. Kickoffs are set for 7 p.m.